One of the country’s leading scientists and former ISRO chairman, G Madhavan Nair, today propounded the theory that some shlokas in the Vedas mention the presence of water on the moon, and that astronomy experts like Aryabhatta knew about gravitational force much before Issac Newton. The 71-year-old Padma Vibhushan awardee said the Indian Vedas and ancient scriptures also had information on metallurgy, algebra, astronomy, maths, architecture and astrology way before the western world knew about them. Speaking at an international conference on Vedas, he however, added that the information in vedas was in a “condensed format”, which he said made it difficult for modern science to accept it. “Some shlokas in one of the Vedas say that there is water on the moon but no one believed it. Through our Chandrayaan mission, we could establish that and we were the first ones to find that out,” Mr Nair said, adding that everything in the Vedas could not be understood as they were in chaste Sanskrit. He also talked very highly about fifth century astronomer-mathematician Aryabhatta, saying, “We are really proud that Aryabhatta and Bhaskara have done extensive work on planetary work (sic) and exploration of outer planets. It was one of the challenging fields,” said Mr Nair. “Even for Chandrayaan, the equation of Aryabhatta was used. Even the (knowledge of) gravitational field… Newton found it some 1500 years later… the knowledge existing (in our scriptures),” he added. Mr Nair, who was ISRO chairman from 2003 to 2009, also claimed geometry was used to make calculations for building cities during the Harappan civilisation and that the Pythagorean theorem also existed since the Vedic period. Mr Nair’s come against the backdrop of many BJP leaders talking about ancient Indian scriptures having scientific information, including on plastic surgery and aero-dynamics. “The Vedas had a lot of information in the field of space and atomic energy. We were fine until 600 BC. Then came the time of invasions till Independence. Since then, we are growing. We deciphered the atoms for peaceful use,” Mr Nair said. While serving in ISRO, Mr Nair had made significant contributions to the development of multi-stage satellite launch vehicles. “As a scientist, I would say that the computations evolved those days were really fantastic. The Vedanga Jyotisa (one of the earliest books on astronomy) is one of the texts, which is evolved in 1400 BC… this is all recorded,” he said. “These are the fundamental findings which the Western world did not have any knowledge of. The only drawback was this information was condensed to bullet form and the modern science does not accept this. And to read the Vedas, one must also know Sanskrit,” Mr Nair added. 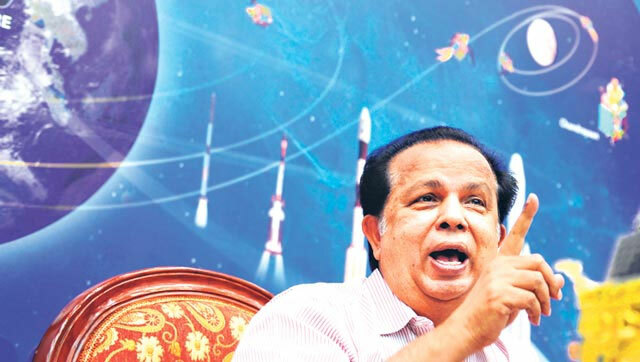 One of the country’s leading scientists and former ISRO chairman G Madhavan Nair on Saturday propounded the theory that some shlokas in the Vedas mentioned about presence of water on the moon and astronomy experts like Aryabhatta knew about gravitational force much before Issac Newton. Speaking at an international conference on Vedas, he, however, added that the information in vedas was in a “condensed format” which made it difficult for the modern science to accept it. “Some sholkas in one of the Vedas say that there is water on the moon but no one believed it. Through our Chandrayaan mission, we could establish that and we were the first ones to find that out,” Nair said, adding that everything in Vedas could not be understood as they were in chaste Sanskrit. He also talked very highly about fifth century astronomer- mathematician Aryabhatta saying, “We are really proud that Aryabhatta and Bhaskara have done extensive work on planetary work and exploration of outer planets. It was one of the challenging fields. “Even for Chandrayaan, the equation of Aryabhatta was used. Even the (knowledge of) gravitational field… Newton found it some 1500 years later… the knowledge existing (in our scriptures),” he said. Nair, who was ISRO chairman from 2003–09, also claimed geometry was used to make calculations for building cities during the Harappan civilisation and the Pythagorean theorem also existed since the vedic period. The comments by Nair came in the backdrop of many BJP leaders talking about ancient Indian scriptures having scientific information including on plastic surgery as well as aero-dynamics. In ISRO, Nair had made significant contribution to the development of multi-stage satellite launch vehicles. “As a scientist I would say that the computations evolved those days were really fantastic. The Vedanga Jyotisa (one of the earliest books on astronomy) is one of the texts, which is evolved in 1400 BC…this is all recorded. “These are the fundamental findings which the western world did not have any knowledge of. The only drawback was this information was condensed to bullet form and the modern science does not accept this. And to read the Vedas one must also know Sanskrit,” Nair said. Mr. Nair and BJP should get the Vedas translated into English and put it on a web page. Regarding the condense format, we have to discover the key for unravelling the knowledge. The composer of sutras must have composed the sutras for use at their times and for posterity. We must also accept that Vedas failed to emphasize the objective verification of a concept/ idea. It was, perhaps, a reason for loosing the knowledge of Vedas. We must not repeat the same mistake now. Incredible, it is all there what I don’t understand why Indian’s or Sanatan Dharma does not enlighten them in the name of our lord. I am keen to put my hands on Vedanga Jyotisa. It would be nice if some one lists the slokas so that people who have enough background of Sanskrit literature can look into these statements. I am not doubting them, but eager to know. We should try to decipher information contained in Vedas. 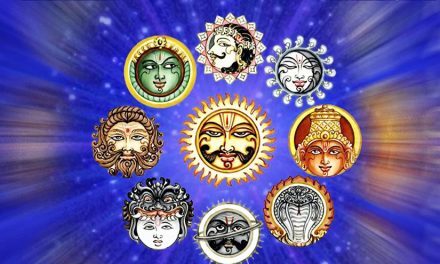 In astrology Moon is given significator of manas wavering mind.Watery tatwa….Simly.Kuja or Mangal is considered as Bhoomi putra .So Mangal has all the Earthly charecteristics. SHUKRA is Venus is Lakshmi God of wealth .Saturn is farthest planet and dark or darkest .Where as Jup.is Deva Guru.Advisor .Very large.Good for Growth.Mercury is nearest to sun.youngest prince.Intelligence significator. There are many such mentions in our scriptures which we till now know that these are discovered by westerners. I am in the process of compiling these and propose to bring out in the form a book. Till then Hindus should remain proud of their rich heritage and should not imitate west by wearing suit in scorching heat in India. is a solution for all of our problems. Can any one help me to please learn Sanskrit? Why should they translate Vedas into english… All are thinking that the east is more civilized and running towards east. They are giving importance to the east and learning their culture and language as quick as anything and running away. If anyone are interested in vedas let them learn sanskrit and study only at reputed sanskrit vedic academies. There is nothing wrong in translating the Vedas and their science content in English. Let us not go on an ego trip asking Westerners to learn Sanskrit and study the Vedas, they have done that already, Max Mueller for one. The English versions would primarily benefit scores of young Indian scientists most of whom have no knowledge of Sanskrit. It saves a lot of time for future scholars. The statement is true but is very mundane. We should seek , search, learn and propagate the wealth of knowledge left behind for posterity by our fore fathers and create an environment of knowledge and knowing rather than trying to boast merely with some traces of evidence. Let every one be made aware and in the process knowledgable and we need to prove nothing to anyone else more so the westerners. Much credit & praise deservedly belongs to India in the field of mathematics. Especially important is the Hindi numerical system, including the concept of 0. This replaced the cumbersome Roman numerals, with which much of algebra and all calculus would be impossible. India to this day produces some of the best mathematicians ever. 1. Chaste Vedic scripture which could not be deciphered until the Western Scientific Method combined empirical measurement with mathematical concepts, And was able to use maths to accurately predict & describe physical phenomena of complex systems, makes them merely academic studies. Gravity as a concept was a great leap, but ended there. Newton not only muses & mentions gravity, he invented Calculus to calculate, predict and verify physical bodies in motion. Newtonian Physics, not Vedic Maths, flew humans to the Moon. 2. Romans, despite their awkward math, were excellent Engineers. Roman built bridges that today carry trains through the Alps. The Pantheon is still the largest unsupported concrete dome in the world. 3. Vedic Maths had such great potential, but were not generally used for large scale public works, urban planning & infrastructure (Roads, tunnels, aquaducts, sanitation, lavish bath houses,…). They were also not used to measure the size of the Earth, the size & distance to the Sun & Moon, to predict eclipses & comets. 4. Early Renaissance scholars Knew that there was water on the Moon, named and mapped the “Seas”, which still carry their original names (despite their total absence of liquid water). 5. Because of the abortion of Vedic Maths before they were put to practical use, Modern Science, Technology and Large Industry developed in Europe, but stalled in the East. 6. Vedic Maths are so intrinsically woven into Scripture, they could not have produced Modern Science, which, by definition, must exclude the Supernatural. That belongs with philosophy, mythology & metaphysics, Not science. Max Mueller was British Agent and his translation has created more confusion and helped distroy Vedanta Knowledge. he is the idiot who profound Aryan Invasion Theory which is defunct yet these Euro centric are totally blind and refuse to accept. Our vedas & Purans are rich in science. Rishi Vyas gave fundementals of open channel flow, Rishi Bhrigu gave Astrology, Jal Shashtra, Bernoullies equation was first propoundee by Rishi Vyas & so on a long list. We should propound our vedas by making them easy. You are right – Shlokas are admirable but practical application requires an entirely different approach. Stephen Beres is right. Our scriptures are wonderful but practical application is different and it needs a creative perception. Bring Sanskrit and veda scholars, scientists and industrialist on one platform. Keep the politicians out of this at any cost. And soon you will find the old glory of India resurfacing which will benefit not only India but the entire world. Because knowledge belongs to the human race. If scientists like Dr. Madhavan Nair can bring forth the knowledge lying in the abysmal depth of vedic literature, it would be a yeoman service to the world at large which is torn apart with several convictions and persuasions. We must rise above faiths to scientifically analyze the facts available in which ever language or region and make such knowledge for the betterment of the humankind, environment and universe at large and that is precisely is the expectation of the hidden forces!! If we do not want to translate Sanskrit slokas into English, fine. But we can translate them into Hindi, Tamil, Malayalam, Bengali, Odish etc. so the Indians at least can be enlightened who in turn will educate and enlighten the rest of the world. Let us all work towards bringing the soul of wisdom of Sanatan Dharma for the benefit of “Sab ka Vikas”! Let us have “Sab Ka Sath” for this endeavour!! Jai Bharat! Why PM Modi is inviting world to make in India? If science and electronics is buried in Veds. We failed to see “Vashudhev-Kutubkam” and Na Tasya Partima Asti’ in Veds. Veds are our literary treasures which tried to stop us inventing gods in advance, but we didn’t bother till day. Veds are wishfull-poems of our ancestors to keep us from Idol-making and worshiping. How long shall we keep buried in illusion? Our kids are suspecting us as jhooth-bolne wale, hate mongers. I was ready to reply something similar. Very nice job Stephen. Hindu scientists as Mr. Nair should accomplish something for the real world based in those vedic knowledge of the past. Scientific achievements requires evidence of usefulness more than mere claims and statements. You need to stop thinking about these things in a modern detective perspective. The Vedas are eternal (Sanatan). They are not ‘composed’ by humans or other beings. They are revelations which are understood by Dhyaana. They have to be learnt under the guidance of a Guru only and not simply memorized from a text book. They contain sounds and swaras which must be pronounced properly for the saying to be effective. Similar to most of Sanskrit vocabulary, they cannot be translated into English without losing their quintessential meaning. That the Vedas never ‘verified’ anything is wrong. There is no need to verify for something which is realized knowledge. Vedic knowledge is above the three modes of material nature. Hope this clarifies. Depends on how you define Science. As a scientist myself, I know that any systematic study of knowledge is ‘science’. However, your assertions are not fully true. You seem to imply that the West has actually realized the purport behind these scriptures which is false. Any injunction be it Vedic or otherwise can be used for both spiritual and material benefit. The primary reason for Vedic existence was to lead a purposeful material life ultimately culminating in realization of transcendental knowledge. Vedas were not revealed to create the next big technological breakthrough. They were revealed by seers of yore to help in the process of self realization and relief from Samsara (cycle of birth and death) which is the cornerstone of Hindu/Sanatan philosophy. That they contain a lot of modern science proposes is an inherent property of these systems of knowledge. That there has been no practical application of this knowledge is entirely wrong. If you visit any Hindu temple, the entire temple complex is built in strict adherence to Agama Sastras which take into account all the scientific and mathematical revelations of the Vedic scriptures. The sad part is common Indian populace were kept away from this knowledge due to the submissive nature of the invasions India has been through and sadly that continues to this day. on multiplying yuga,sahashtra and yojana we get the average distance between earth and sun. I should have specified: my comment was directed toward Stephen, I had not yet read the other replies. I am not astonished by the claims made by G. Madhavan Nair. I have read all the above mentioned comments too. as far as the translation of vedas is concerned, undoubtedly it has been done earlier by various scholars in the past but all the translations vary from one another. reason is apparent. Indians(including me) look vedas differently than westerns and other peoples of the world. if science is empirical it must be unbiased too…for example agre pateenam misunderstood by Max Muller as agne pateenam did much harm than anything else for India. The Hindu religion (Sanatana Dharma) is actually more than 80000 years old some believe it is actually in lakhs of years older than other civilizations. It is the western historical manipulated records which claim it to be just several thousand years old. Today the same western historians have revealed this but it is being hushed up. But truth is out there and it will definitely come out…. mail it to the PMO. I suggest that Mr Vaidyanathan who has commented above could set the ball rolling…. I am surprised that you are such an ill-informed person about Engineering feats of Ancient India. However, I don’t blame you as majority of Indians don’t know & care about their past. First of all, the rapid development of Science & Technology in Europe in middle ages has lot to do with “Conquering the World” principle. 1. It was not Newton who invented Calculus. It was Madhava (Kerala, South India) invented Calculus 6 years earlier than Newton. These texts reached Europe through Jesuits and took several decades for European scholars to understand this. Finally Newton & Leibniz were able to understand and put into use. 2. You have to remember that India was under foreign rule for more than 1000 years. During those 1000 years, massive destruction of temples, universities, ancient cities, education, culture etc. happened. When British came to India, the literacy rate is much higher than Britain and they adapted Indian education system and uprooted Indian education system. They replaced with an education system to generate coolies to work in their Government. 3. Perhaps you aren’t aware of Harappa, Mohenjadaro etc. (Hundreds of years older than Egypt, Greece & Rome) were lot bigger & better planned than Rome or Greece. Also, there are many archaeological findings revealed closer ties between India & those countries you mentioned. 4. The rise of Europe came at the cost of destruction of Asia & America. Both India & China together were adding 60% of world GDP till 1700. Finally, Whatever happened in the past, there is an unprecedented leap in Science & Technology in the last 100 years (again inspired by Vedic philosophy). The ultimate aim of Science is to realize the ultimate truth… The objective of technology is exploit scientific principles to our advantage (relative). * Read more about how great scientists like Schrodinger, Heisenberg, Einstein, Nikola Tesla & many more were heavily influenced by the Vedic philosophy. Kali Yuga: When Did It End and What Lies Ahead?